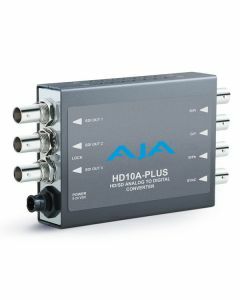 HD10A-Plus builds on AJA’s successful HD10A Analog to Digital Mini-Converter with new components that allow the same level of performance and capability users have come to expect from AJA, but at a lower price point. End-to-end 10-bit processing ensures the highest quality conversion and output. HD10A-Plus can be completely configured using external DIP switches for fast and easy configuration in the field, within mobile and AV setups or behind a rack in your facility. HD10A-Plus’s low power consumption and compact size make it perfect for on set use, where it can run off battery power, as well as throughout a facility or AV installation for on-the-spot conversion.